Pocket sized computers such as the Raspberry Pi have transformed DIY computing over the years. Here in 2017, the IoT juggernaut is gathering pace and is taking things to another level as the next generation of potential development platforms arrives. Robotics and open source hardware provider DFRobot cater to the niche product needs for robotic enthusiasts. The platform began by winning the hearts and minds of the robotic aficionados who provide tools, electronics, training for schools, hacker spaces, and hackathon events. Creative communities are joining forces to collaborate and to create modern tech products that inspire each other to learn and let their creative spirit run wild. DFRobot believes that learning, sharing and creating are the perfect trio to build a base of futuristic ideas that will enable users to achieve proficiency in the art of tech creation. A combination of inspiration and user-friendly products highlight how our imagination is the only limit when it comes to the art of the possible. However, the innovation driven platform is now attempting to pave the way to bring revolutionary changes to the world. Step forward, LattePanda, their portable single board computing device that takes the lead in the department of size and efficiency. The revolutionizing mobile single board computing device leaves iPhone behind when it comes to its size, by being 40% smaller than the Apple favorite. A computer that is the size of a packet of cigarettes somehow has an Intel Cherry Trail Z8350 Quad Core Processor, 2GB Ram and 32GB flash storage. But when you throw in 1x USB 3.0, 2x USB 2.0 ports, onboard Wi-Fi 802.11n 2.4G and Bluetooth 4.0, this compact PC demands to be taken seriously. However, it’s not all about the size. 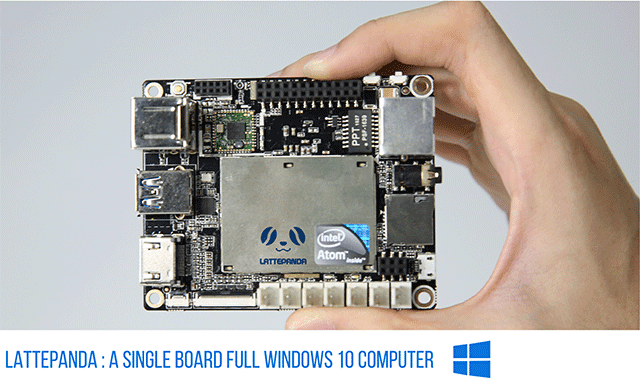 The small single board computing device can also run a full version of almost every operating system available in the market, most notably Windows 10. What makes it unique is the device’s adaptability, being compatible with every gadget and gizmo the market has to offer. The combination of being Arduino compatible, and the ability to use Windows 10 as its primary operating system will capture the attention of techies. The Raspberry Pi competitor packs a punch is double the price of many alternatives, although it’s worth noting that cheaper iterations offer a much lower spec and flexibility. One of the biggest challenges facing the developer communities was the lack of available tools needed to create Windows-based projects. LattePanda is attempting to solve this problem by adding Windows to these small computers. For anyone that either needs a little more power for their projects or feels more comfortable with the luxury of having Windows 10 as an OS, it will be worth paying a little extra. LattePanda is serving as an alternative that has all the same (if not better) technology than a traditional PC. Use cases include emulating gaming consoles along with designing and printing three-dimensional structures. With torrent downloads and TV access made easy too, it’s easy to see why so many early adopters are stepping into the future with DFRobot and the opportunities that LattePanda might offer. When I spoke to Ricky Ye, the CEO of DFRobot on my podcast, he advised how they were passionate about not discriminating from DIY experts, hobbyist, educators to researchers and engineers. Everyone is welcome to bring their ideas to the table and he hoped that the creation of innovative and user-friendly products will become the building blocks for future projects and prototypes. The project was brought to life by over 4,000 backers on Kickstarter who pledged over £440,000. Only time will tell if developers and creatives put this technology through its paces and unlock its creative potential.